Dream Conservatories Online are a DIY conservatory company established in 2005 and dedicated to providing the DIY market with exceptional products at trade prices. We are trading standards approved as part of their Buy With Confidence scheme and provide exceptional support to those wishing to invest in a conservatory. Dream managed to remain at the forefront of the Double Glazing and DIY Conservatory industry for over a decade while providing an extensive range of products and technical knowledge to support those wishing to build a conservatory from kit form. The styles are largely defined by the shape of the roof. Below we have a brief description of each of the styles or conservatories most requested, but rest assured, we can provide whatever style matches your interest. The lean to or traditional style of conservatory is by far the most common and simplest style there is. The pitched conservatory roof slopes away from the wall of your home, most often toward the garden. You will also find this style of conservatory on the side of properties, being used as a utility room or sun trap. It is often the cheapest and most basic style there is, but still versatile and ideal where space is of a premium. To find out more about the lean to conservatories click here. The Victorian conservatory style is a bay fronted conservatory and often comes with a 3 or 5 faceted roof. This stylish and curvy style of conservatory will match the look of most homes. This style is not the most efficient in terms of maximising the space within the conservatory, but it is often the stylish curved face of a Victorian conservatory that people fall in love with most. Find out more about the Victorian style here. The Edwardian design is the next most popular type of conservatory. Being square or rectangular in shape it enables the maximum amount of floor space to be utilised as there are no curves taking up the corners. Despite the orthogonal shape, the design remains elegant and full of statement. The Edwardian roof is pitched on all four sides and ideal for allowing the maximum amount of light into the room with the tall ceiling. To find out more about our modular Edwardian conservatories click here. The P shaped conservatory is a combination of two or more conservatories. They can be combinations of the same style or of different styles. Combining two conservatories together to create a grand new style and design altogether, is what makes a P shaped conservatory. Often the new style is clearly thought through and necessary due to limitations in space or because there is an existing conservatory in situ. Although on many occasions, it is a grand statement of design intent. The L shaped conservatory is most often situated wrapped around corners. They are ideal for maximising the use of space where a gable extension juts out from the main body of a house. The L shaped conservatory is more likely to be a lean to type of conservatory wrapped around a corner. Although you could wrap any style of conservatory around a corner, in many homes the lean to style fits neatly. An orangery is more than just a different style of conservatory. While some may look similar to a conservatory, there are some very distinct differences. Orangeries are more akin to extensions than conservatories. They generally do not have a door dividing the extension to the main part of the house. You may have a door, perhaps a high quality bi-fold door, but the general idea is that part of you house is seamlessly extended into this new glass building with an atrium style roof. So while the conservatory is a glass building attached to the end or a part of your home, the Orangery is really a glass extension that becomes an integral part of your home. There are key design subtleties with an Orangery and the overall grand look and feel are quite different. 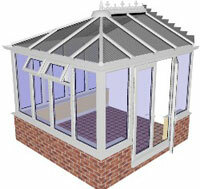 Dream Conservatories Online now supply custom orangeries for DIY construction, delivered in kit form. All our supplied conservatories are delivered in kit form with everything that you need to complete the installation. The DIY conservatory kit has been specifically created for each installation, carefully packaged and double checked to ensure that everything you need is included. It does not matter whether you are installing a basic lean-to conservatory or a more complex custom design with a solid roof, everything will be packaged and included to enable you to successfully complete the install. To find out more about the various stages of the DIY conservatory construction read more. 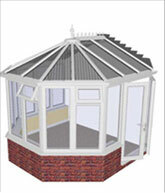 The shape of the roof very much defines that type of conservatory you will have. A flat roof means the conservatory will be a traditional style or Lean To. A pitched roof on four sides will define the conservatory as an Edwardian style. The roof can be provided in three main types of materials. Polycarbonate, Glass and now the new solid roof from Celsius. The transparent roofs come in different shades and U values making them able to help maintain the temperature within the conservatory. The difference between a glass roof, solid rood and polycarbonate roof can make a significant difference to the overall cost of the conservatory. For more information about our conservatory roof system click here. The Celcius solid roof adds a new dimension to conservatories. They provide an ideal way of transferring the humble conservatory into an extension. Change of use does mean you may require building regulations, so this is certainly something you should talk through with us first. The engineering masterpiece created by Celcius means that you can have an energy efficient, eco-friendly tiled roof, with Velux windows, supplied on site in kit form and installed by you on your new conservatory. Each roof is custom made for each project and delivered in kit form. Like all the DIY conservatory assembles, their design simplifies construction. The new solid roof is available in Terracotta, Brown and Black. The structural system has insulated panels and the solid roof employs a patented environmentally friendly tile system that does not require battens, making it easier and faster to install with an exceptionally high quality finish. The steel base has grown from strength to strength over the years. The Durabase steel base and modular wall system has been designed for the DIY conservatory market and it enables you to install a base and a conservatory from scratch in as little as a week. The advantages of using the steel base and modular wall system are numerous and not just confined to cost and time savings. 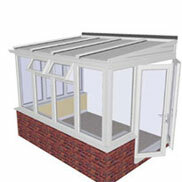 Ordering the base at the same time as the conservatory ensures that they are a seamless fit. To find out more about the Durabase system and for a full comparison between the Steel base and a traditionally built foundation read here. Traditionally, conservatory prices can range from £10,000 upwards. Depending on the final installation they can go all the way up to £100,000 and beyond. At these top end prices you would normally expect a fully fitted Orangery, but as you can see prices can vary greatly. This large price, compared to a DIY conservatory is due to the labour. With the DIY market you save on the labour. Additionally, there is often a healthy mark-up made on the actual materials themselves. Our DIY conservatories however, are sold at trade prices. Contrast the traditional conservatory prices with DIY prices. The price of a DIY conservatory can start from as little as £2,000. You can have a grand Orangery that will cost closer to £15,000 but most self build conservatories will be somewhere in the region of £3,000 to £8,000, depending on the style, size, roof type and fixtures and fittings. To find out more about our conservatory prices click here and to get a quote click here. The best way to start the process is to get a Quote for the style and size that you have in mind. We can provide a comprehensive quote for any style of conservatory that you require. The process is very simple and starts with a collection of your requirements. The initial form is very simple to complete and can be found here – conservatory quote form. Investing in a conservatory may be one of the most rewarding home improvement projects that you embark upon. The pleasure that you get on a day to day basis from your own conservatory is unlike any other part of you home. But when you are carrying out the installation yourself, you will probably want to feel confident that you can get the job done well. A large part of that is support. That's why we place special emphasis on our support. Our team has been through the process thousands of times and have a great knowledge of our products and the type of requirements that can cause people problems. To start the process, fill out the quote form and you will experience out attention to detail and commitment to customer service. And when we talk about support we’re not just talking about a manual, a YouTube video or a DVD, we’re talking about someone to talk to that understands the exact product you have. We have talked many customers through this process and know how to help you to get your beautiful very own conservatory efficiently installed. Dream Conservatories Online were the first online DIY conservatory company to be approved by the Trading Standards in their Buy With Confidence scheme. Some, very few though, have followed suit. Because we are Trading Standards Approved you have complete peace of mind when you make your purchase. Click here to find out more about our Trading Standards Approval. Here are some questions to consider before you start your project: • Will you need conservatory planning permission? • What foundation are you going to use - a steel base conservatory? • Will you get at least a 25 year guarantee on your conservatory base? • Does your conservatory come with a steel conservatory base? • How long will it take you, days or weeks? • What is a guide to your conservatory prices? • Do you have access to experts that can help you along the process if you get stuck • How will you insulate your conservatory for all year use? • Will you get at least a 10 year guarantee on your conservatory roof ? • Will the conservatory glass you choose meet the safety regulations? We had our Dream conservatory erected a few weeks ago by two local recommended fitters. Everything went to plan and we are delighted with the end product. It took five days start to finish. We saved approx £4500 from the best quote by a local company. I wanted to drop you a line to say how pleased we are with our new conservatory. It has been really easy to assemble and we are really happy with the quality of the product and the customer service we have received. You impressed me with the way that you represented the company and were able to give direct answers to my questions without hesitation and assured me that you would always be available to answer any queries and that you were not the sort of company that would take my money and then abandon me! !